Heat stress is one of the major burdens to human beings in the current scenario. Researchers and professionals have looked at the relationship of occupational heat stress and its health impacts. It is only in the recent years; medical research has produced few articles and papers on this subject. The aim of this paper is to present an overview of studies in the area of occupational heat stress and health to find out whether there are relations between specific job features or characteristics and heat-related health disorders and reduced well-being. First, the concept of occupational heat stress and its effects will be discussed, and the empirical studies that were published in the last few years subsequently challenge in conducting studies in this field will be discussed. To achieve this aim, a summary of the various studies undertaken over the last 10 years will be provided. Various techniques and approaches, both quantitative and qualitative techniques, to measure the heat stress and its effects will be discussed. The challenge for every person is to successfully interact with his/her environmental variables. People working in various industries are exposed to excessive heat burden in addition to environmental temperature. The workers face many health problems because of high heat exposure. Research in occupational heat stress is much needed to find out the health impacts and suitable intervention to protect worker's health which subsequently reduces the morbidity. Many numbers of studies have been done in Western countries, but most of them were done in experimental setup. Methods to quantify the heat strain vary in different countries and different professional groups. Only a few studies had been documented in India, especially in the Northern part. Workers are backbone of a country. Hence, it is indeed much needed to do more studies on this field to protect worker's health. There are many challenges and constraints a researcher face while doing studies in industrial set up. India is a country with very hot summer seasons and millions of poor workers likely to be affected by excessive workplace heat. More than 90% of work in the informal sectors and more than 68% of the workers are uninsured. Climate change, physical labor, and poor working conditions have a huge impact on the working population in India. Climate change study in India is challenging not only due to the occurrence of four distinct seasons but also due to its geographical heterogenecity. In India outdoor and indoor work without air conditioning is a major human heat strain. Exposure to excessive heat in workplace can cause various health problems starting from mild skin rash to fatal heat stroke. Some of the health impacts are sweating, dehydration, salt loss, loss of perceptual and motor performance, heat exhaustion, loss of ability to work intensively due to heat exhaustion, increased accident risk, increased body temperature >37°C (>38°C involves heat strain, >39°C is dangerous except for short periods, >40°C can lead to the serious effects such as heat stroke, unconsciousness, death). Chronic health effects of excessive heat exposure include worse clinical status for people with common chronic diseases (aging working population), kidney damage due to daily dehydration if lack of water access. A wide range of clinical observations and measurements have been used to indicate heat strain, ranging from the perception of workers to hospitalization due to heat stroke. More than 20% of people are being estimated to have health impacts of heat stress, ranging from skin rash to heat stroke. Apart from heat, many confounding factors also play a role in health impacts. With all these issues, it is important to identify globally acceptable heat strain parameters and methods. Such methods can be used as relevant indicators locally by the health professionals to develop health surveillance and prevention programs for workers to protect the worker's health. Recent studies have shown that the impacts of heat stress on the health of workers were getting more, and this clearly tells more quantitative research has to be done to find out the exact depth of damage. Heat stress can be defined as the sum of environmental and metabolic heat loads which increases the core body temperature (CBT) of an individual that may potentially cause physiological decrements. Occupational heat stress is a well-known hazard in workplaces with strong local heat sources (such as glass and metal factories) and in outdoor work situations with strong sunlight and hot environmental conditions (such as in certain agricultural, mining, quarrying, construction, and shipbuilding occupations). , During the hot season in tropical and sub-tropical countries, the general environmental heat conditions can reach levels that create occupational health risks and reductions of worker productivity in any outdoor workplaces. Such heat levels can occur even in the shade or indoors in workplaces without local cooling devices. Climate change will make this situation worse in many places. The health risks due to an increased CBT or excessive sweat loss and dehydration are very well known as consequences of exposure to heat. Yet, the methods to quantify heat exposure, heat stress, and the physiological and clinical health effects of heat strain vary in different countries and between different professional groups. The environmental temperature depends on various factors air temperature, humidity, dew point, etc., Among these factors, human comfort depends on ambient temperature and relative humidity which ranges from 20°C to 27°C and 35-60%, respectively. Human beings feel uncomfortable when these two factors get increased. The warming up of environment can warm up the human body. The commonly used heat stress indicator or indices is wet bulb globe temperature (WBGT). The WBGT index, evaluated by Yaglou and Minard, is a well-established and widely used heat stress index that is associated with human physiological reactions to heat and the limits these reactions create for work intensity and workplace heat exposure levels. Special equipment is needed to measure WBGT according to the standards (ISO, 1989). Such equipment has three thermometers measuring natural wet bulb temperature (Tw), black globe temperature (Tg), and common air temperature (Ta). Tw is measured inside a water wetted small cloth sock, which simulates the heat exchange effect of evaporation from sweat covered skin. Tg is measured inside a black globe, which simulates the uptake of heat on the skin from heat radiation (e.g., solar radiation). Many others methods also available to measure the ambient temperature such as Universal Thermal Climate Index, Humidex, etc., but WBGT is considered as the gold standard in measuring the ambient temperature. The physiological strain is evident as a rise in heart rate as thermoregulatory demands for increased cutaneous blood flow are added to those of the working muscles in competition for the cardiac output, before the onset of heat illness. Heart rate is influenced by the work rate and environmental heat stress in addition to several other intrinsic factors such as emotional state, body composition. A wide range of clinical observations and measurement have been used to indicate heat strain, ranging from perception of workers, observational parameter such as skin rash to hospitalization due to heat stroke. The heat strain parameters that were measured in the previous studies include CBT, skin temperature, sweat rate, resting/working heart rate, urinary specific gravity, urinary catecholamine, serum creatinine, serum electrolytes, muscle biopsy (for assessing rhabdomyolysis), energy expenditure, VO 2 max. , Most of the earlier studies on assessing physiological effects have been conducted on experimental settings rather than actual field settings. Such studies although provides us with important information on the relationship, it might not be possible to use the same methodology at workplace. Specific heat wave events in the Northern hemisphere have been associated with marked short-term increases in mortality, with reported excess mortality ranging from 4% to 142%. It is estimated that in 2003, up to 70,000 additional deaths occurred over the summer months in Western Europe as a consequence of severe heat waves. It has been estimated that, in Australia, 4336 people died between 1803 and 2002 as a consequence of heat waves, twice the number of fatalities caused by cyclones or floods over the same period (Judith McInnes, 2008). In Queensland, 22 deaths and 350 injuries occurred during a heat wave in January 2000, and in February 2004, 12 deaths and 221 hospitalizations were attributed to the heat. In the USA, heat waves are estimated to have caused about 400 deaths per year since 1998, more than that for any other natural disaster. The combination of heat stress, dehydration, and physical activity impose challenge for physical adjustment, with potential risk of ensuing heat-related injuries and disorders, for example, heat cramp, heat exhaustion, and heat syncope. The risk of heat stroke among working people is well known and explained by the limits of human physiological adaptability. A significant number of working people dies due to heat stroke even in high-income countries as described in a study of agricultural workers in the USA. Apart from clinical health effects, work capacity is affected by excessive heat exposure, and hourly work output is reduced. A substantial amount of body water may be lost as sweat, including loss of fluid through respiration, gastrointestinal tract as well as kidney. Increased dehydration disturbs the homeostasis of the body leading to decreased skin blood flow, elevated CBT, and decreased sweat rate leading to impaired to tolerance to work resulting in increased risks of heat injuries. Continuous exposure to excessive heat may cause profound increase in heart rate which may lead to sympathovagal imbalance if not treated appropriately. Heart rate is useful in evaluating the exertion required by physical labor in working conditions. Acclimatization may be helpful in maintaining the CBT and heart rate within normal range in workers exposed to excessive heat. The impact of occupational heat stress is not well-documented. The studies examining the association of occupational heat stress and changes in heart rate, CBT are equivocal. There are only a few studies done in India about occupational heat stress and its health impacts. 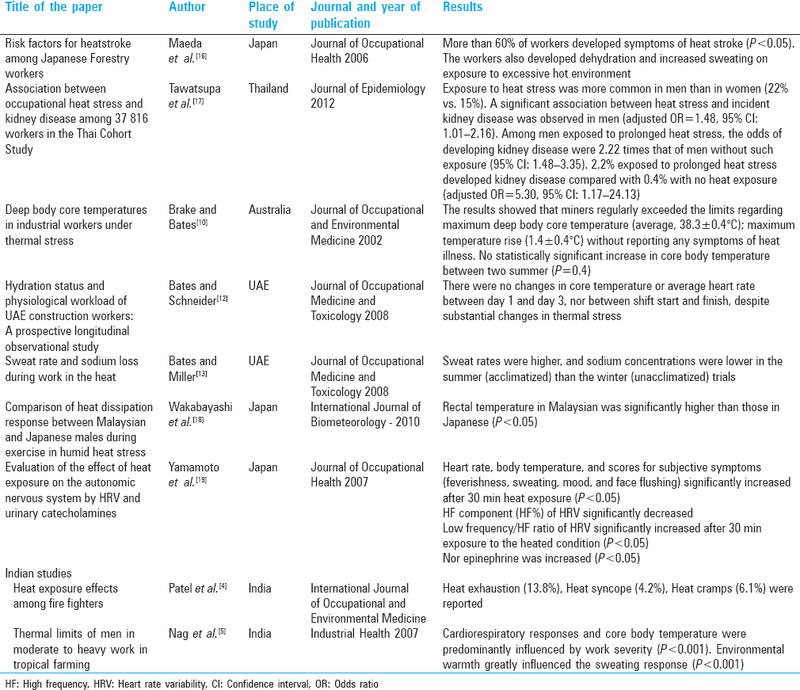 Hence, it is very essential to do better-designed studies in India to document the health impacts of occupational heat stress [Table 1]. In this review, studies addressing the health impacts due to occupational heat stress are only highlighted. In general, research field has many challenges and constraints depending on the study. Some strategy has to be taken to overcome those challenges. Research in occupational heat stress in India is limited because of several challenges and constraints. Few challenges and methods to overcome those have been enumerated below. This is one of the most important constraints for a researcher working in occupational heat stress. Limited awareness among management seems to play a major role. The management of the particular industry will restrict the researcher from publishing data if the results are perceived by the management, to be harmful to the reputation of the industry. This can be sorted out by orienting the management on benefits of research studies and also request help from government agencies to convince the industries. There is a noticeable disconnect between worker's perceptions and their ability to secure workplace improvements related to heat stress from the management. Researcher should emphasize the health benefits and productivity improvement to the industry management as well as to the workers. There are many unorganized sectors where the heat exposure and health outcome are more than the formal sectors. The health impacts are more in informal sectors due to the lack of proper infrastructure. People tend to work for more time to earn more money which causes excessive heat strain and that affects the health of the worker. The proper work plan should be followed by such sectors such as duration work, availability of water, time for rest in between work, etc. The medical details of each worker should be monitored periodically and should be documented. Documented medical records can be used by public health professionals for interventions and surveillance. Proper medical attention should be provided for the worker during the necessary period. Health education should be provided to the management highlighting the benefits of record keeping which can save money, manpower, and time. Proper design should be chosen to establish association between exposure and outcome. For example, cross-sectional cannot establish association between the exposure to heat stress and its health outcome. To overcome this, a pilot cross-sectional study can be done to generate the prevalence of the health condition and use the information for calculation of sample size for the studies with better study design. Cross-sectional studies will also help to understand the nuances of the processes followed in the industry, requirement of the resources for planning future studies, for planning interventions. Case-control and cohort study designs can be chosen which have a higher strength to establish the association of exposure and response. To extend further depending on the funding and cooperation from the industry, a randomized control trial with an intervention study can be conducted. A sensitive and very accurate health indicator are lacking in the field of occupational heat stress. Although CBT (rectal) can be taken as an indicator for heat strain, there are various practical difficulties to measure in the field set up. In addition, there are social and cultural issues which add difficulty to a researcher to measure the rectal temperature. Heart rate can be used as an indicator to measure the cardiac strain due to excessive heat exposure. There are many confounding factors for changes in heart rate which should be properly ruled out. Sweat rate is used by some researchers as an indicator for heat strain. Many factors such as type of sweat glands, ambient temperature, working environment, emotion, stress, etc., play a significant role in measuring the sweat rate. Such factors should be properly taken care of. Heart rate variability and urinary catecholamine were also used in some studies to monitor the heat strain in workers. A proper study design with a good planning of measurement and periodic monitoring can help to find out a sensitive health marker or an early indicator which can detect the disease at the early stage and can reduce the morbidity [Table 2]. There are few studies conducted in the field of occupational heat stress. Some studies show an association between heat exposure and CBT and change in heart rate ,, and some show no association between exposure and outcome. , The exact hypothesis between heat exposure and specific health outcome is yet to be answered clearly. Hence, more studies are required in this research area to examine the effects of occupational heat stress [Table 3]. Occupational heat stress is a major health issue with several potential negative health and well-being outcomes. Proper and correct guidelines will help in mitigating the effects of excessive heat exposure on the health of workers. Therefore, it is very much essential in the current scenario to study the health impacts due to heat stress among workers which may provide valuable information to protect their health through planning and implementing suitable interventions to reduce morbidity and mortality which subsequently increase the productivity. This manuscript is a part of our study titled assessment of heat stress and its impacts on the health of workers from different occupational sectors funded by Indian Council of Medical Research. IPCC Climate Change. Synthesis Report. Contribution of Working Groups I, II and III to the Fourth Assessment Report of the Intergovernmental Panel on Climate Change; 2007. Parsons K. Human Thermal Environments: The Effects of Hot, Moderate and Cold Environments on Human Health, Comfort and Performance. 2 nd ed. New York: CRC Press 2002. Dash SK, Kjellstrom T. Workplace heat stress in the context of rising temperature in India. Curr Sci 2011;101:496-503. Patel HC, Rao M, Saha A. Heat exposure effects among fire fighters. Int J Occup Environ Med 2010;10:121-3. Nag PK, Nag A, Ashtekar SP. Thermal limits of men in moderate to heavy work in tropical farming. Ind Health 2007;45:107-17. Kjellstrom T, Holmer I, Lemke B. Workplace heat stress, health and productivity - An increasing challenge for low and middle-income countries during climate change. Global Health Action 2009;2. Bernard TE, Pourmoghani M. Prediction of workplace wet bulb global temperature. Appl Occup Environ Hyg 1999;14:126-34. Dehghan H, Mortazavi SB, Jafari MJ. The evaluation of heat stress through monitoring environmental factors and physiological responses in melting and casting industries workers. Int J Environ Health Eng 2012;1:21. Tawatsupa B, Yiengprugsawan V, Kjellstrom T, Seubsman SA, Sleigh A; Thai Cohort Study Team. Heat stress, health and well-being: Findings from a large national cohort of Thai adults. BMJ Open 2012;2. pii: e001396. Brake DJ, Bates GP. Deep body core temperatures in industrial workers under thermal stress. J Occup Environ Med 2002;44:125-35. Morioka I, Miyai N, Miyashita K. Hot environment and health problems of outdoor workers at a construction site. Ind Health 2006;44:474-80. Bates GP, Schneider J. Hydration status and physiological workload of UAE construction workers: A prospective longitudinal observational study. J Occup Med Toxicol 2008;3:21. Bates GP, Miller VS. Sweat rate and sodium loss during work in the heat. J Occup Med Toxicol 2008;3:4. Available from: http://www.health.vic.gov.au/environment/heatwaves.htm. [last accessed date is 24 th July 2016]. Lundgren K, Kuklane K, Gao C, Holmér I. Effects of heat stress on working populations when facing climate change. Ind Health 2013;51:3-15. Maeda T, Kaneko SY, Ohta M, Tanaka K, Sasaki A, Fukushima T. Risk factors for heatstroke among Japanese forestry workers. J Occup Health 2006;48:223-9. Tawatsupa B, Lim LL, Kjellstrom T, Seubsman SA, Sleigh A; Thai Cohort Study Team. Association between occupational heat stress and kidney disease among 37,816 workers in the Thai Cohort Study (TCS). J Epidemiol 2012;22:251-60. Wakabayashi H, Wijayanto T, Lee JY, Hashiguchi N, Saat M, Tochihara Y. Comparison of heat dissipation response between Malaysian and Japanese males during exercise in humid heat stress. Int J Biometeorol 2011;55:509-17. Yamamoto S, Iwamoto M, Inoue M, Harada N. Evaluation of the effect of heat exposure on the autonomic nervous system by heart rate variability and urinary catecholamines. J Occup Health 2007;49:199-204. Ayyappan R, Sankar S, Rajkumar P, Balakrishnan K. Work-related heat stress concerns in automotive industries: A case study from Chennai, India. Global Health Action 2009;2:1-7.